The manufacturing process of our uprights has had a subtle change since October 2017. Prior to this, the measurement between holes was 130mm and since October 2017 this measurement has changed to 128mm. The reason for this is that the machinery used to drill multiple holes at once conforms to the building standard module 32. This means that any measurement used is divisible by 32 (32 x 4 = 128) and the machinery is adjustable in steps of 32mm. 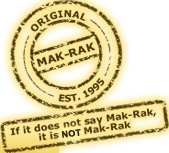 This change only affects existing Mak-Rak customers (before October 2017) if additions want to be made to an existing installation. The difference of 2mm seems very small but the longer the upright the greater the difference becomes between holes as you get closer to the top and the new uprights are slightly shorter. For example, if you take a UP16, the first holes at the bottom will be in line but every hole after that accumulates by 2mm so by the time you reach hole 16, the last hole of the new upright will be 30mm lower than the old upright. The overall length will also be 30mm shorter. Ideally, if you have existing Mak-Rak and want to extend, then leave the existing as is and extend by adding separate bays of the new sizes. If you really want to physically attach your new bays to your existing unit? Let us know so that specific uprights can be manually drilled from blanks to match the OLD. There is a charge for this. If youre not sure how to proceed then please do not hesitate to give us a call or Contact Us via the link on our site and we will gladly assist and advise where necessary.